FILE - An employee walks past storage tanks for contaminated water at the tsunami-crippled Fukushima Dai-ichi nuclear power plant of the Tokyo Electric Power Co. in Okuma town, Fukushima prefecture, Japan, Feb. 23, 2017. More than six years after a tsunami overwhelmed the Fukushima nuclear power plant, Japan has yet to reach consensus on what to do with a million tons of radioactive water, stored on site in around 900 large and densely packed tanks that could spill should another major earthquake or tsunami strike. The stalemate is rooted in a fundamental conflict between science and human nature. Experts advising the government have urged a gradual release into the Pacific Ocean. Treatment has removed all the radioactive elements except tritium, which they say is safe in small amounts. Conversely, if the tanks break, their contents could slosh out in an uncontrolled way. Local fishermen are balking. The water, no matter how clean, has a dirty image for consumers, they say. Despite repeated tests showing most types of fish caught off Fukushima are safe to eat, diners remain hesitant. The fishermen fear any release would sound the death knell for their nascent and still fragile recovery. “People would shun Fukushima fish again as soon as the water is released,” said Fumio Haga, a drag-net fisherman from Iwaki, a city about 50 kilometers (30 miles) down the coast from the nuclear plant. And so the tanks remain. 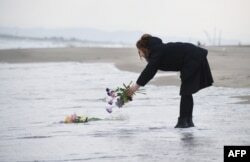 FILE - A woman puts flowers into the sea to pray for victims of the 2011 earthquake and tsunami in Sendai, northern Japan, March 11, 2016. Fall is high season for saury and flounder, among Fukushima’s signature fish. It was once a busy time of year when coastal fishermen were out every morning. Then came March 11, 2011. A 9 magnitude offshore earthquake triggered a tsunami that killed more than 18,000 people along Japan’s northeast coast. The quake and massive flooding knocked out power for the cooling systems at the Fukushima nuclear plant. Three of the six reactors had partial meltdowns. Radiation spewed into the air, and highly contaminated water ran into the Pacific. Today, only about half of the region’s 1,000 fishermen go out, and just twice a week because of reduced demand. They participate in a fish-testing program. Lab technicians at the Fukushima Prefectural Fisheries Experimental Station at Onahama Port in Iwaki city prepare fish to measure cesium levels for safety tests under the prefecture's experimental fishing program, Oct. 12, 2017. Lab technicians mince fish samples at Onahama port in Iwaki, pack them in a cup for inspection and record details such as who caught the fish and where. Packaged fish sold at supermarkets carry official “safe” stickers. Only three kinds of fish passed the test when the experiment began in mid-2012, 15 months after the tsunami. Over time, that number has increased to about 100. The fish meet what is believed to be the world’s most stringent requirement: less than half the radioactive cesium level allowed under Japan’s national standard and one-twelfth of the U.S. or EU limit, said Yoshiharu Nemoto, a senior researcher at the Onahama testing station. That message isn’t reaching consumers. A survey by Japan’s Consumer Agency in October found that nearly half of Japanese weren’t aware of the tests, and that consumers are more likely to focus on alarming information about possible health impacts in extreme cases, rather than facts about radiation and safety standards. Fewer Japanese consumers shun fish and other foods from Fukushima than before, but 1 in 5 still do, according to the survey. The coastal catch of 2,000 tons last year was 8 percent of pre-disaster levels. The deep-sea catch was half of what it used to be, though scientists say there is no contamination risk that far out. A fish retailer at the Onahama fish market in Iwaki City, Fukushima, cuts up tuna fish from Miyazaki, southern Japan, Oct. 12, 2017. Demand has slumped for Fukushima fish thanks to the lack of public awareness and confidence about fish safety since the 2011 nuclear disaster. Naoya Sekiya, a University of Tokyo expert on disaster information and social psychology, said that the water from the nuclear plant shouldn’t be released until people are well-informed about the basic facts and psychologically ready. He and consumer advocacy group representative Kikuko Tatsumi sit on a government expert panel that has been wrestling with the social impact of a release and what to do with the water for more than a year, with no sign of resolution. FILE - A worker, wearing protective suits and masks, takes notes in front of storage tanks for radioactive water at Tokyo Electric Power Co's (TEPCO) tsunami-crippled Fukushima Daiichi nuclear power plant in Okuma town, Fukushima prefecture, Japan, Feb.10, 2016. The amount of radioactive water at Fukushima is growing, by 150 tons a day. The reactors are damaged beyond repair, but cooling water must be constantly pumped in to keep them from overheating. That water picks up radioactivity before leaking out of the damaged containment chambers and collecting in the basements. There, the volume of contaminated water grows, because it mixes with groundwater that has seeped in through cracks in the reactor buildings. After treatment, 210 tons is reused as cooling water, and the remaining 150 tons is sent to tank storage. During heavy rains, the groundwater inflow increases significantly, adding to the volume. Another government panel recommended last year that the utility, known as TEPCO, dilute the water up to about 50 times and release about 400 tons daily to the sea — a process that would take almost a decade to complete. Experts note that the release of radioactive tritium water is allowed at other nuclear plants. Tritium water from the 1979 Three Mile Island accident in the United States was evaporated, but the amount was much smaller, and still required 10 years of preparation and three more years to complete. A new chairman at TEPCO, Takashi Kawamura, caused an uproar in the fishing community in April when he expressed support for moving ahead with the release of the water. The company quickly backpedaled, and now says it has no plans for an immediate release and can keep storing water through 2020. TEPCO says the decision should be made by the government, because the public doesn’t trust the utility. “Our recovery effort up until now would immediately collapse to zero if the water is released,” Iwaki abalone farmer Yuichi Manome said. 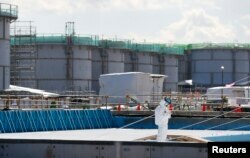 Some experts have proposed moving the tanks to an intermediate storage area, or delaying the release until at least 2023, when half the tritium that was present at the time of the disaster will have disappeared naturally.